Pack of 10 Groz-Beckert® Regular Sharp Point Overlock Sewing Machine Needles. 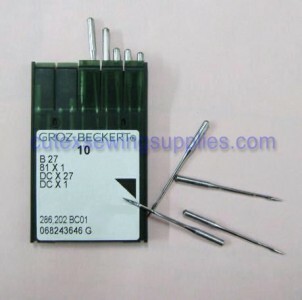 Pack of 10 Groz-Beckert® Overlock Sewing Machine Needles. Groz-Beckert DCX27 needles are available in following sizes. Please e-mail us with make/model of your sewing machine if in doubt. We stock many different style of sewing needles. Even if you don't find the one you looking for, it does not mean we don't have it in stock. Please let us know with needle system (style) number and/or machine make & model and we will find one for you.